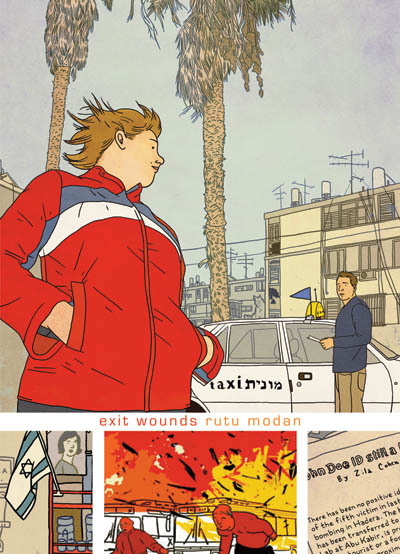 Exit Wounds is the first full-length graphic novel by Israeli author Rutu Modan. This is a nice smaller work with two strong and contrasting major characters, both of whom have closed themselves to different sorts of truths. Israeli life is a strong background echo which supports rather than informs the central themes of estrangement. The writing is the strongest thing here, but the art is mostly very good. The colouring is flat and harmonic (a little like Chris Ware), but occasionally a bit too busy. Her composition can be exciting and dynamic, but so often it isn't. Most unusually, her line work often feels most expressive in her background work, with primary faces and hands awkward and empty. This can perhaps be said of the whole work: it breathes in the background, and falters in the foreground. For example, the illumination of Israeli life is subtle but rich, but pleasantly background. The main characters have moments that feel genuine, but they have too much space to work in here, or perhaps not enough. Whatever the failings, though, there is more than enough talent here to make me keenly anticipate a sophomore work.